Offering Aboriginal women the option to give birth in their own community could strengthen Aboriginal women’s business and cultural obligations, according to research by a Charles Darwin University Honours student. 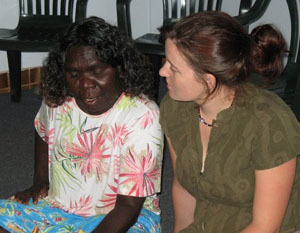 Research in one remote Northern Territory Aboriginal community by Honours student and remote area midwife, Sarah Ireland, revealed that Indigenous women were not offered the choice of giving birth in their own community. Ms Ireland said that routine practice in all remote Aboriginal communities across the Northern Territory was to transfer pregnant women into regional centres to wait for labour and give birth in a hospital. “Despite this accepted practice, peri-natal statistics show that a small number of women continue to give birth in their communities,” she said. Findings from the period 2003-2007 showed that women in the research community had a substantially higher rate of birth outside of hospital compared with the rest of Australia (9.35 per cent versus 0.7 per cent) despite having no access to health system sanctioned, community-based birth services. Ms Ireland said that among other major findings, her research revealed that there was a breakdown in traditional birthing practices. “The purpose of my research was to describe the experiences and document the maternal and infant outcomes of women who had given birth in their community ‘on country’,” she said. “In the research community, it was found that women, through their previous experiences of standard care, appeared to make conscious decisions and choices about managing their subsequent pregnancies and births,” she said. Ms Ireland said another significant finding to emerge from her research was that most babies born in the community over the five year period were healthy. “The audit showed that women were more likely to encounter complications during their pregnancy or immediately after birth, rather than during labour,” she said.